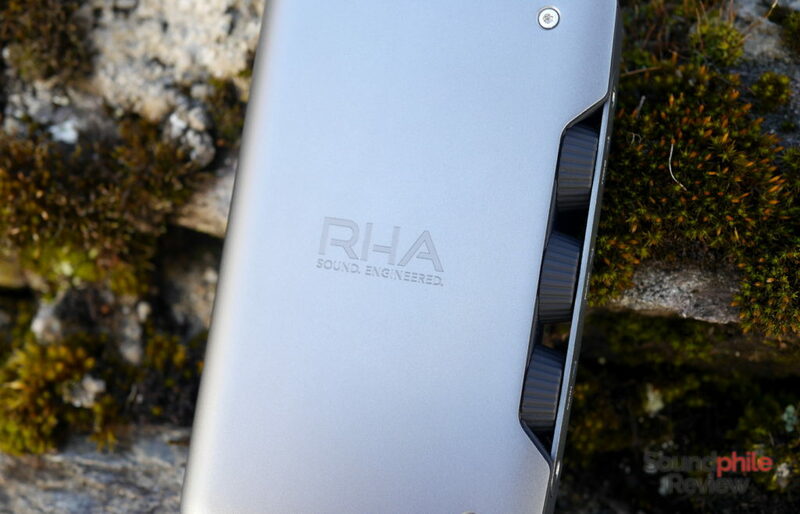 RHA’s first foray in the amplifier market goes by the name of RHA Dacamp L1 and is a portable DAC and amplifier. Enclosed in an aluminium shell and sporting top-notch components, the Dacamp L1 was tailor-made for the RHA CL1 Ceramic, but it sounds great with most headphones, of course. It’s a bit bulky, but it is full of features that make it a great choice for those situations when you need portability but don’t want to compromise on features or sound quality. Disclaimer: RHA sent me a unit on loan. It was returned after I completed my tests. RHA’s website has its official specs. RHA did not spare any expenses when designing the Dacamp L1’s packaging. You can learn more about it in the Out of the Box article I published. RHA’s first foray in the portable DAC/amplifier market is a story of success, at least when we consider design and build quality. RHA has a long history of using metal in its products and the Dacamp L1 is no different. The device is clad in an aluminium armour that covers three out of the six sides; a fourth side is also partially covered, while the rest is made of soft-touch plastic. 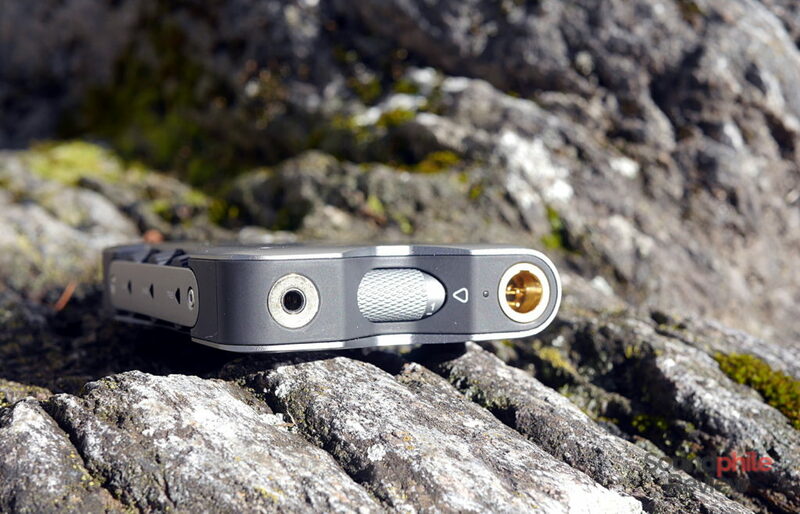 The extensive use of thick aluminium lends the Dacamp L1 a very solid look, and that is furthered by the clear-cut lines of the design. The RHA Dacamp L1 is massive. Not only is it fairly large (118 x 73 x 20 mm), but it’s also a good bit heavy (233 g). This makes it portable, but I don’t see it as a device you can fit in your pocket – it’s more suited to a bag or a backpack. It’s a great pairing with a notebook, though, and it allows you to improve sound quality while away from your desk with your desktop devices (i.e. Topping DX7). Inputs and outputs are clearly organized, with inputs on the bottom and outputs on the top. The only exception to this is the line out connector, which sits on the bottom. The top hosts one 3.5 mm jack output, one mini-XLR4 output, the volume knob and a status LED. 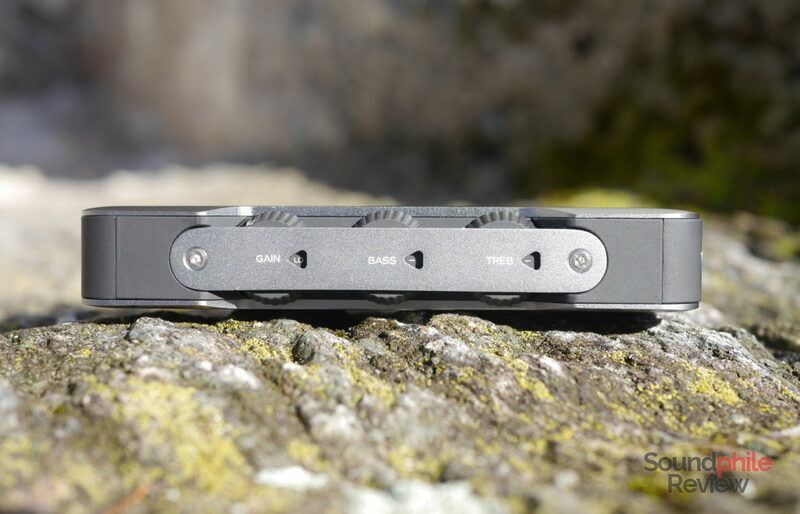 On the opposite side, the bottom hosts a line-out 3.5 mm jack output, a combined 3.5 mm jack and optical input connector, a full-size USB port, a micro-USB port and a physical switch. The right side is home to three different knobs: they adjust gain, bass and treble. They are protected by an aluminium slab, which has holes in it sk you can see the current level on each knob. Though they are not large, the holes allow you to see with good precision the current level. The volume knob also acts as the power switch: when it is set to zero, the device is off. To turn it on you just need to move it to the desired value – it also clicks to give you a tactile and auditory feedback. It is solid and it requires a bit of force to be operated. The machined surface also helps gripping it. In terms of input and output options, the RHA Dacamp L1 has a complete offer and rivals larger devices. The choice of mini-XLR4 is, though, rather peculiar; the standard for balanced connections of IEMs seems to be moving towards the 2.5 mm TRRS jack, which is widely used on DAPs (i.e. Aune M1s or FiiO X5 rd Gen). The adoption of the mini-XLR4 standard means one can’t use balanced headphones with 2.5 mm TRRS connectors; luckily, adapters from one standard to the other exist. The switch on the bottom makes it possible to select the input source – either the 3.5 mm line in connector, the micro-USB port or the full-size USB port. Using the former bypasses the internal DAC and allows you to use the Dacamp L1 only as an amplifier; the latter is meant to be used with computers and Android phones without requiring an adapter cable. As the battery inside the RHA Dacamp L1 is rather large, it is possible to use it to power one’s mobile devices using the full-size USB port. 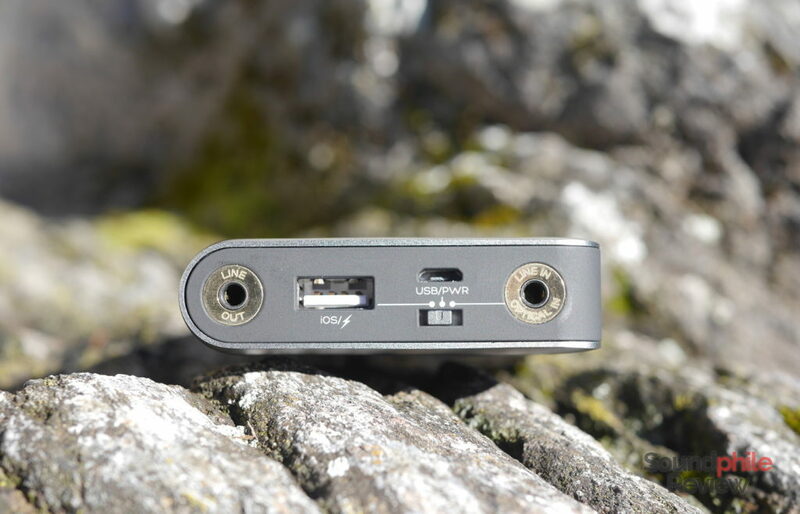 By connecting a smartphone (or any device which requires charging) the Dacamp L1 acts as a power bank, though one needs to move the gain knob to the position indicated by the bolt. To my pleasure, the RHA Dacamp L1 supports Linux and the company explicitly mentions it – something of a rarity in the consumer world. Windows and macOS are obviously supported, though Windows users need to download a driver package in order to use the device. 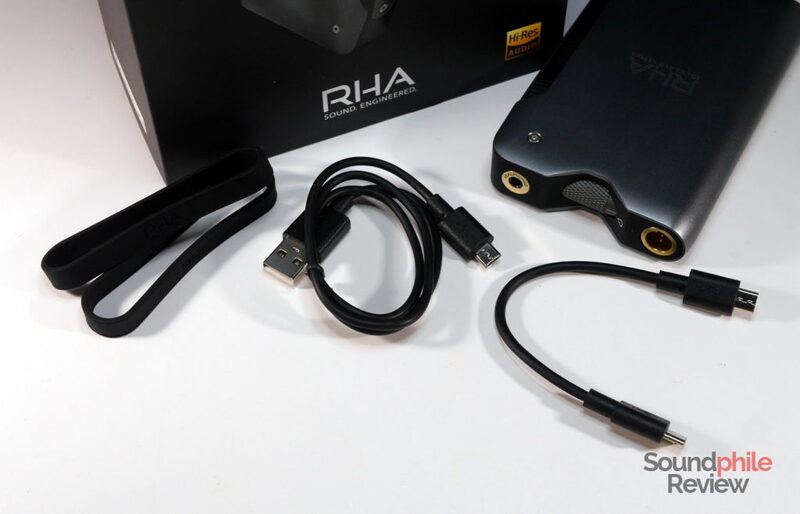 RHA opted for the ESS Sabre ES9018K2M DAC chip, the same as the Topping DX7. The two undisclosed amplifier chips are Class AB. The DAC is now superseded by the ES9038, but it is still actual – and, as we’ll see in the “Sound” section, it sounds good. It supports PCM streams up to 384 kHz / 32 bit and DSD up to Quad DSD (also known as DSD256). This makes it rather flexible and makes it a good option for the most demanding users who want to listen to high-res audio while on the go, or just for those who look for a compact solution that does not clutter the desk. Output impedance is 2.2 Ω, meaning it should be safe using 16 Ω headphones – the ideal 1:8 ratio means the minimum headphone impedance should be 17.6 Ω, but the difference is really small and I would deem it safe to use 16 Ω headphones. 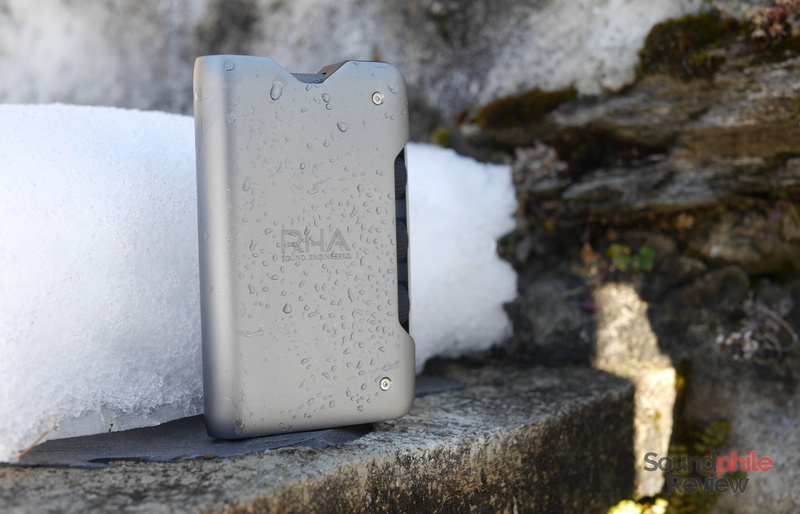 The massive 4000 mAh battery inside the RHA Dacamp L1 offers great battery life. When using the device as a headphones amplifier, thus excluding the DAC, it can run for more than 12 hours, depending also on the volume and the gain level you choose. Using it as a DAC, too, eats away a couple of hours, bringing the Dacamp L1 to a solid 10-hour run before it needs charging. These numbers are not that impressive per se. It has to be said, though, that since the Dacamp L1 is able to drive headphones up to 600 Ω with competence, 10-hour battery life is a good achievement. It is more than the average working day or enough for you to spend a whole Europe-US flight using it and it should be more than enough to accommodate any use case. I tested the RHA Dacamp L1 with the RHA CL1 Ceramic, the Sennheiser HD 6XX, the Meze 99 Classics, the RHA T20i, the KZ ZS6, the Venture Electronics Asura 2.0s and the HiFiMAN HE-560. Source files were FLACs with few 320 kbps MP3s. Despite being designed in conjunction with the RHA CL1 Ceramic, the Dacamp L1 only needs to be set at volume ~1.5 to drive the headphones with plenty of loudness. I tend to listen to music at low volume, but setting it to ~1.5 makes it loud enough to hit my upper bound (around 75 dB). This is an indication of how much power it can output, given how the CL1 Ceramic is a high-impedance, low-sensitivity headphone. In fact, the RHA Dacamp L1 has plenty of power and it can drive even relatively hard-to-drive headphones such as the HiFiMAN HE-560 or the Sennheiser HD6XX to good volumes and sound quality. I haven’t had a chance to try it with higher impedance headphones. Unless you really want to blow your eardrums, though, or if you have some really hard to drive headphones, the RHA Dacamp L1 should be more than enough to power your listening sessions without you ever wanting for more. My idea is that this is a portable amp anyway, so I wouldn’t expect 2 W of output from it – what would I do with all that power on the go anyway? The RHA Dacamp L1 is very neutral in its sound presentation, with no audible influences over the sound. Everything is rendered with accuracy and detail; the RHA Dacamp L1 brings no colour to the table, meaning that the sound is kept as faithful to the source as possible without introducing warmth, brightness or any other colouration. In this sense, the Dacamp L1 is really “solid state” sounding, as it does not possess that warmth and relaxing atmosphere that characterise many tube amplifiers. It does not deviate from what should theoretically be and there are people who might consider it a bit sterile because of this. But it delivers rich details and a full body, features that make for a rich listening experience and can satisfy the demanding audience it targets. Transients are fast and there’s a good sense of speed that make fast headphones really shine. I am also surprised by the dynamics, as the Dacamp L1 is capable of delivering dynamic sound that spans from the slightest whisper to the thundering blows of a cannon shooting. It does render lower volume sounds correctly and is able to drive headphones with authority even at lower volumes, so you won’t miss anything just because you’re wishing for some quieter listening. Even bass is there – both with quality and quantity – at the lowest volumes. Soundstage is decently wide and deep, and instrument separation is superb. When paired with resolving headphones, the Dacamp L1 shows its prowess and it never let me down on this front. When talking about how the Dacamp L1 sounds neutral, let’s not forget it has two knobs to equalise sound. They allow you to tune it to your liking and to add or remove bass and treble. In my day-to-day listening I never really used it – I never felt the need to do so, as I prefer as neutral a sound as possible – but I found it handy when trying the CL1 Ceramic. Their excessive treble brought me to use the “-3” treble adjustment on a somewhat stable basis. I find it especially useful that RHA included the ability to decrease bass and treble as well as to increase it; the equalisation works flawlessly and the 12 total levels (from -3 to +9) make it possible to really get the desired tuning out of the headphones. When it comes to the differences between the single-ended and the balanced connections, I can hear nothing significant. Power output seems to be larger, though, so headphones that are especially power-hungry may benefit from the use of the balanced connection. When compared to the iFi nano iDSD Black Label, the RHA Dacamp L1 offers similar power output and sound quality, but they are starkly different when it comes to features. The only advantage of the nano iDSD BL is the “iEMatch” output which should remove issues with low-impedance, high-sensivity in-ear headphones. The Dacamp L1 wins on every other front, offering a larger array of features. The RHA Dacamp L1 is the company’s first foray in the amplifier and DAC market – and what a result they achieved! 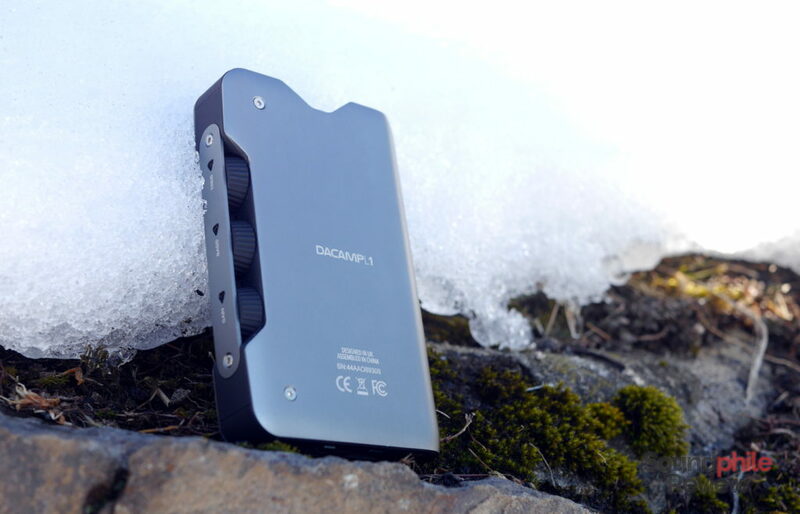 The Dacamp L1 offers everything one would want in a portable device, from a wide range of connections to good power output, from a solid construction to the embedded equaliser, to the ability to serve as a complete source (DAC and amplifier) or as a headphone amplifier. I’m really impressed by what the company was able to create and this is a device I would gladly continue using, if I didn’t have to send it back to RHA. My only complaints are the fact that it is fairly large and heavy (though that’s a minor issue in my eyes) and that output impedance in balanced mode is high. If RHA provided an adapter to use 2.5 mm balanced headphones, it would be even better. If you have the money, the RHA Dacamp L1 is a wonderful piece of equipment that can afford you hours upon hours of great sound quality. It’s a solid contender in its price range and has features that rival those offered by desktop alternatives – and this makes it even more attractive. It may not offer the same lush sound or the compelling features other products in its price bracket offer, but the compromises made create a compelling, competent product. The suggested retail price for the RHA Dacamp L1 is $299.95.